What is “Buy it Safely!”(B.I.S) ? “Buy it Safely!” is Autowini's Safe Payment & Shipping Service whereby Autowini acts as a third party between the buyer and seller in order to make the purchase 100% safe and easy for the buyer. Autowini keeps your money, ships the item on time and takes care of your online transaction throughout the whole process safely all at a low cost! Full customer support throughout the transaction! Feedback within 1 business day is guaranteed! Autowini will check the item is still available and information on the web is correct. Once it’s verified, Autowini put a “Verified Stock” marks on the item. If you want to see more photos and working video of the item to ensure your mind, ask us when you confirm the purchase. Autowini can provide more photos of the item and video when you agree on purchase & price terms. Check our Youtube channel to see videos! Autowini act a role as a third party entity between buyer and the seller and keep your money & transaction safely. You will get refunded 100% when you do not receive items! Autowini holds the item and ship it on a vessel to customers port directly. After shipping you will receive Original B/L documents within time. Don’t worry. You will not be working with computer but working with your “Person in Charge” You can ask any questions throughout the deal and our staff will respond quickly at your request. Feedback within 1 business day is guaranteed! You will know detailed condition on working of engine, transmission, major options and underbody corrosion status through the vehicle condition Report. You can even get compensation If the real condition does not match with the given report! Our Customer Service Staff speaking English, French, Spanish, Arabic and Swahili will give you full customer service throughout the transaction. Get served in your language and feel more comfortable. 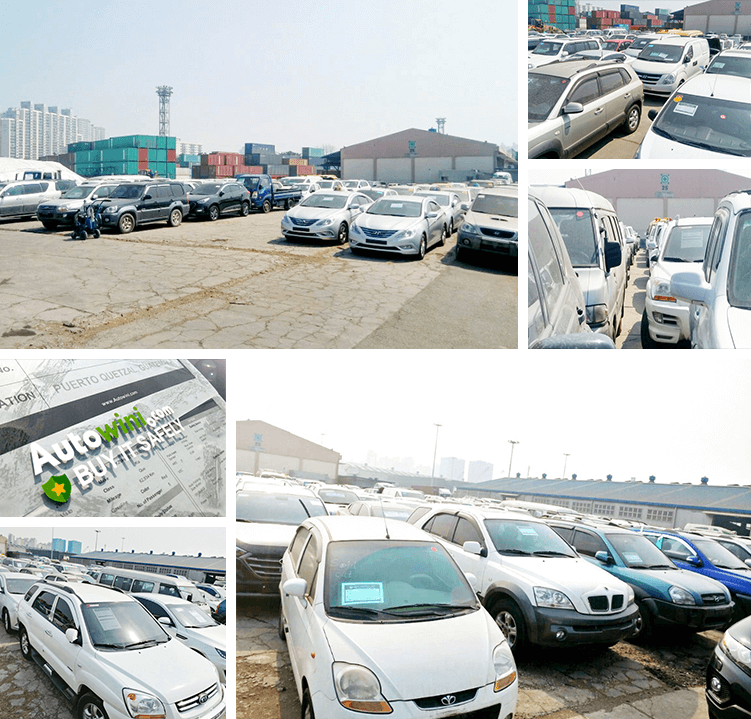 Autowini secures your vehicle safely at the port yard. After the buyer confirms and sends the money to Autowini, sellers send the vehicles to Autowini's port yard. The vehicles will then be secured safely and waiting to be shipped abroad the arranged vessel. Do not worry about the shipping process, Autowini is holding your items safely. Part 1. How to send an inquiry and get a quotation ? Part 2. How to track my order & shipping status ? Part 1. How to send an inquiry and get a quotation ? 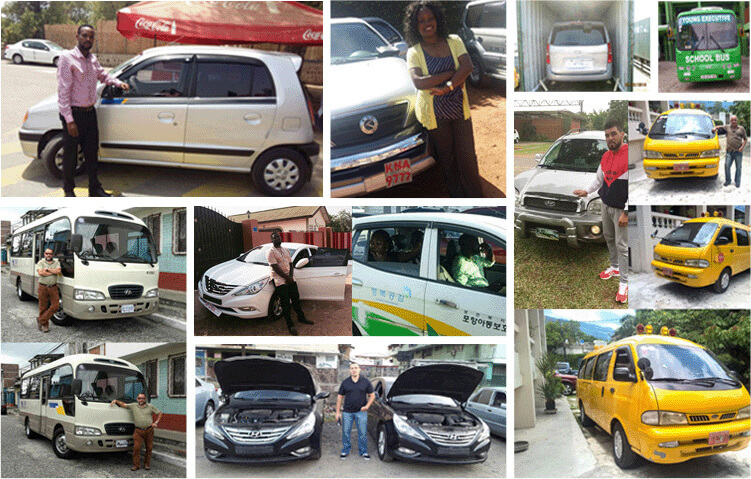 Choose your car and send an inquiry! You will receive reply within 1 business day. 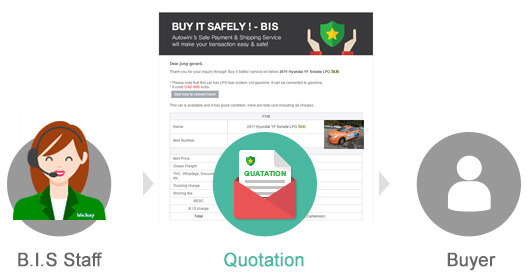 Check your email inbox and see the quotation from Autowini. Make your decision and confirm to purchase by clicking “Confirm to Buy” button. Autowini will check and book an item! Autowini Confirmed your order, you can track your process! Part2. How to track my order & shipping status ? After your order has been confirmed by Autowini staff, your item will be booked and secured for 2 business days not to be sold to any other customer. “Remark” will be appeared when Autowini staff update any information. After you check updated information, Do not forget to click “Check” button. Remark will be disappeared. Fill in your Consignee Full Information to put on Proforma Invoice. 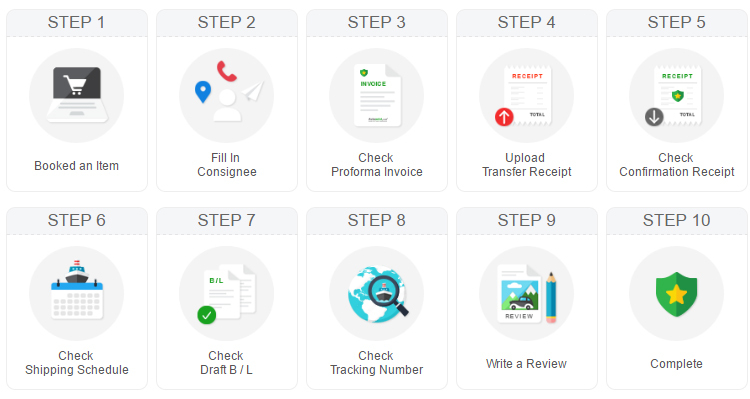 Autowini will issue a proforma invoice with final price and bank account details, then upload it in your order information and send by email too. You can see and download it here! Transfer the total amount in the invoice to the Autwoini’s bank account within valid date of proforma invoice. Upload your transfer receipt here! When Autowini receive money in bank account, Autowini will upload bank confirmation receipt to your order page! The item will be sold “AS IS”condition. Autowini release money to seller and secure your item at Autowini’s hand. Now the item belongs to Autowini and is ready for next step. Autowini will check the fastest shipping schedule and update it on your order page! Soon the item will be booked on the fastest vessel. However shipping schedule is subject to change according to the shipping company’s condition so Autowini will notify a new schedule when it’s changed. After ship departure, Shipping company will issue DRAFT B/L. Autowini will upload it in order page. Check DRAFT B/L carefully. If there is any mistake on your consignee and an item information or want to change consignee, you can request to amend B/L. Track your document delivery and cargo by using below information. 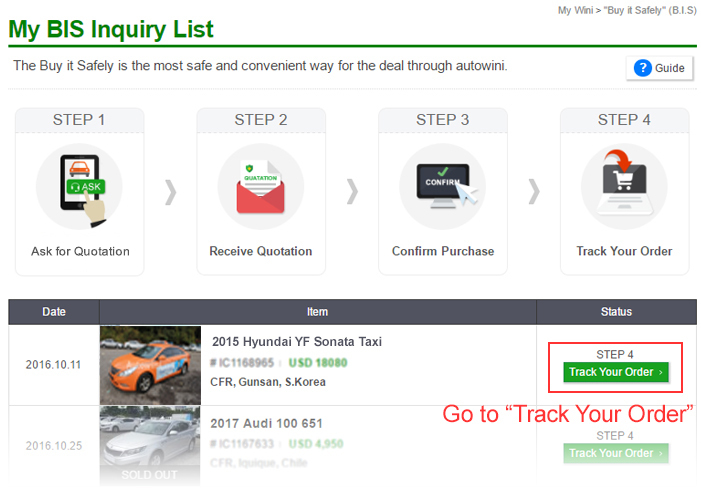 If you click Tracking no and B/L no, you can connect directly with tracking system. Did you pick up your vehicle from the port? Share your experience and get Bonus from Autowini! You’ve got the item successfully! Your order has been completed! To make a payment after confirming an item for purchase, transfer money by T/T to Autowini’s bank account. Check the invoice from the Autowini staff and transfer the total amount to Autowini’s bank account by T/T. Send us a copy of the receipt so our staff can confirm payment. Be careful about fake invoice. If the account information is different from above, please email to bis@autowini.com We will verify it. Can I split the payment? Yes, you can, but total amount of money must be paid within 30 days after the order has been made. We recommend you to transfer money once due to high bank charges. Please note that all bank charges regarding transfer should be borne by the sender (buyer). Autowini will begin the shipping process after receiving the total amount. Can I pay after shipping? No. The full amount must be paid before shipping as the B.I.S service will take care of holding your money safely and shipping the item on schedule. Autowini accepts 100% payment and guarantees a safe transaction. Q Is it safe to purchase cars at Autowini? Also, Autowini has 5 guaranteed programs for your safe trade. Q What are my guarantees? 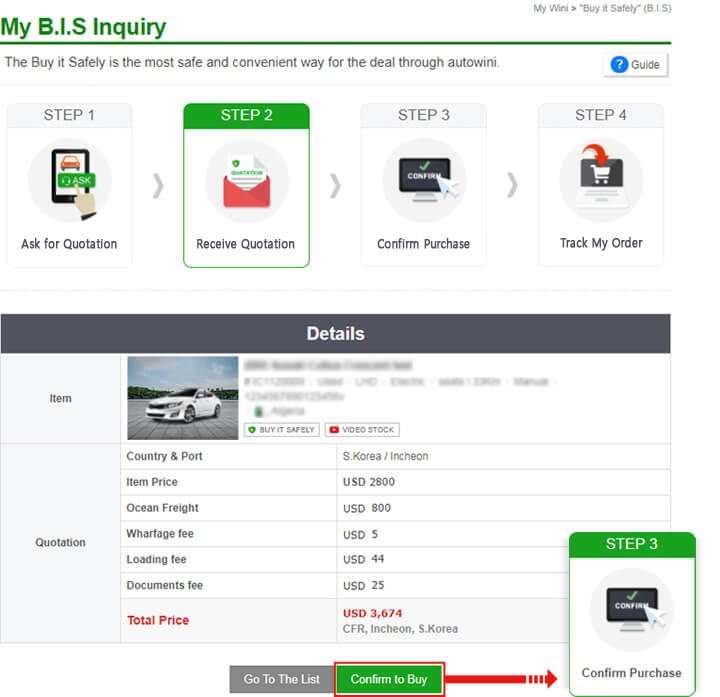 Q What is the process of purchasing cars? Please follow only 5 steps to buy cars at Autowini! The payment's full amount must be 100% completed through a bank transfer, Western Union, or Moneygram. We do not accept partial payment, credit card, nor paypal. Q How can I check the condition of the vehicle? Q Does the price include shipping cost? No. Listed price is the item price only. It does not include ocean freight and other shipping related charges. Please select the shipping type you want. Some shipping type may have extra charge at destination port. (Ro-Ro/Container/Consolidation/FOB) Autowini will give you the final quotation of shipping to your port after submitting an inquiry. Q Does the price include customs tax? No. The price does not include your country's custom duties. You must clear customs by paying the tax separately. Please check the details with your local customs clearing agency. Q How long until the item arrives at my port? Depending on the country, it can take from 10 - 55 days for items to reach designated ports. Autowini books the fastest available shipping schedule when payment is complete. Q Where is Autowini's office located in? Autowini's head office is located in Seoul, South Korea. Our vehicles are also located in South Korea. Q Does Autowini have an agent in my country? 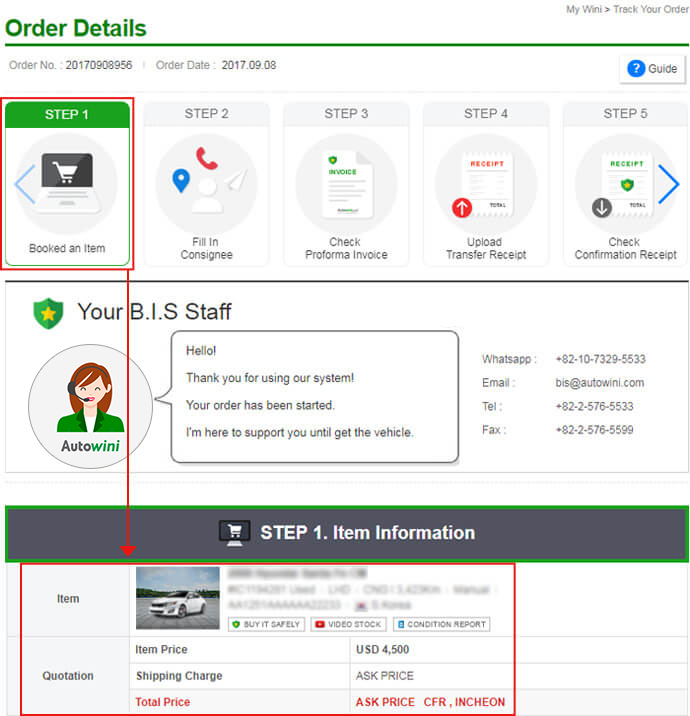 For getting more information, please contact Autowini's customer support team or visit Local Trade Information page in website. Remember there is a team who will take care of your transaction. Do you have any questions? Contact our customer support staff for any help. We are In Service. We are Out of Service. Please write the “Item number” and detailed questions so that we can serve you better. We will make online trading more reliable and convenient for you.